It looks like Carey Mulligan from the backside facing Rob. He seems to be enjoying himself, his beard seems to be growing longer, not a fan of that look, but I do love his smile. Hi there iluvthemovies!!! Agree, love Rob no matter what but prefer him without the beard. Someone on another robsten site said someone tweeted he was with Brit pack & others. But it could be Carey. She is in the City with her hubby. Glad Rob still in the City. I am still hoping he attends the Gala on Monday. Wow Rob's beard grows really fast, he hardly had one before he left. Nice to see him out enjoying his life, hope the paps leave him alone. Nice unintrusive photo. Loving smiley rob! Hi Lisa, yes that would be exciting if he attended the Met Gala. I don't recall where I read this recently, maybe People, that Rob may actually be attending with Kristen. As I told twilight an, it is possible that Rob would attend because we keep hearing rumors about his Dior ads possibly being released in May, he could be the ambassador for Dior at the Gsla wearing one of their suits. Just a theory that could happen. I would be tickled pink if it actually happened, to see both of them there would be wonderful. 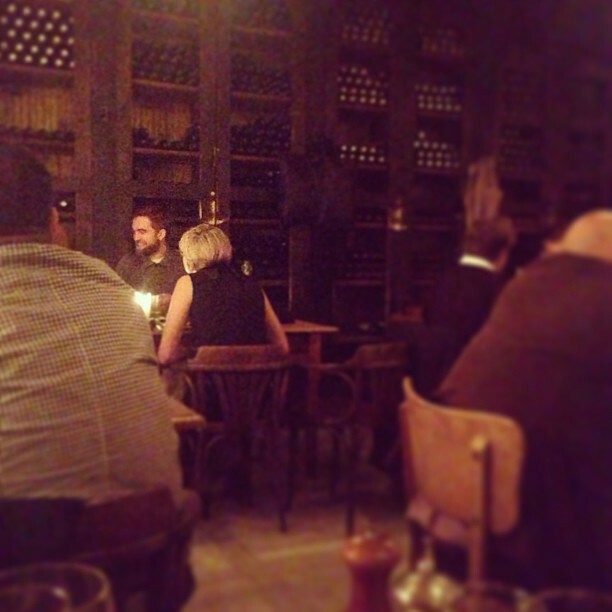 I also read that Sienna Miller would be there as well, I wonder if Tom Sturridge accompany her that evening. I am really excited for this event this year. @iluvthemovies...I had read the same thing about Sienna Miller going. Wouldn't it be awesome if the four of them went? Good morning all my RPL friends. @twilightnan ...if you hop on today...Forever's been at it again on RD. You will have to check it out. His comments under this photo there. Cryptic as ever but interesting! Have a great day all! I wonder what restaurant they are at? @LisaCT, I read that shippers cryptic msg and say he is full of it if it has anything to do with 50 Shades of Grey. I am not a fan of the book and I know I am in the minority here but I hope Rob would not be involved with this movie. I don't know if this will propel the next superstar if they play Grey, but Rob is already a superstar, I want to see him soar to new heights with his career. I could possibly see Rob taking on this role if Gus Van Zant is involved because I know he is a fan of the director. Ugh, no. I liked the Motu as a ff, and I really don't like the plans of making film from it. My opinion is, if any serious actor get involved in this, it won't be good point in his/her career. The storyline and the literature is poor, it was good ff, but it is not literature. And I don't think Rob is interested in it. I don't think I'd like to see either Rob or K do FSoG myself. Rob seems to be going in another direction with film choices anyway. I would love to see him do Mission Blacklist. Hope that pans out. Can't wait to see the Rover too. Those roles are so outside what he's done so far and I can't wait to see him in those films. Twmmy and Lisa I could not agree with you more. Ditto to both of your comments. Here is to Rob going into whole other stratosphere of his career.